I think you’re really blogging brilliantly of late; the marketwatch surely does make good fodder. The discourse of the unregulated/self-regulating market really is the leading edge of ideological lunacy; it’s always a pleasure to note to undergrads that the “free market” is the most regulated object in the world. 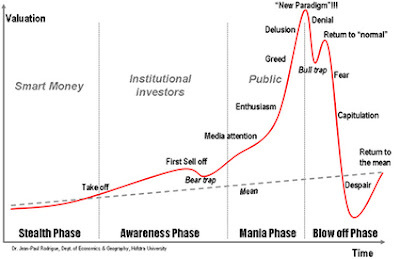 There may be a logical slippage between all the narrrative charts and the “story of the market” (as opposed to the stories people tell about the market’s current state). I would argue that the story of the market begins where narrative ends. 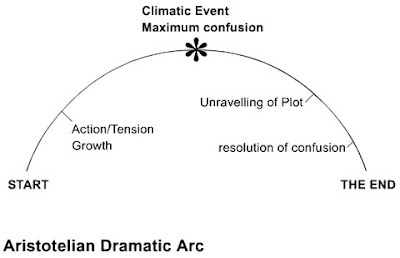 By which I mean: all those narrative shapes are tales of disorder rising and then resolved; the peak is, as one has it, “maximum confusion.” The stories end when forces of disorder are brought to heel and then successfully contained by the act of narrative itself. The market, over its long durée, is meant to take the same shape as “progress”: not an arc but an endless ascent, which has peaks and valleys only when one looks at little slices. The market’s great dream (at least from Smith and Ricardo to Keynes and Dexter White) lies exactly in its non-narrative movement. The true market is post-historical, in some technical sense. It desires to unfold its logic after disorder has been resolved.